Culver City, once the heart of California’s movie industry, was dying just a decade ago. The downtown was decaying. It had become a sleepy commuter town. Today, however, people have proclaimed it an urban renaissance. Parts of the city that were once “forlorn and forgotten” are now crawling with high-tech companies and creative media professionals. Wine bars have sprouted throughout. What happened? It is true that major social changes tend to be caused by the hard work of dozens, often hundreds or thousands, of committed people. 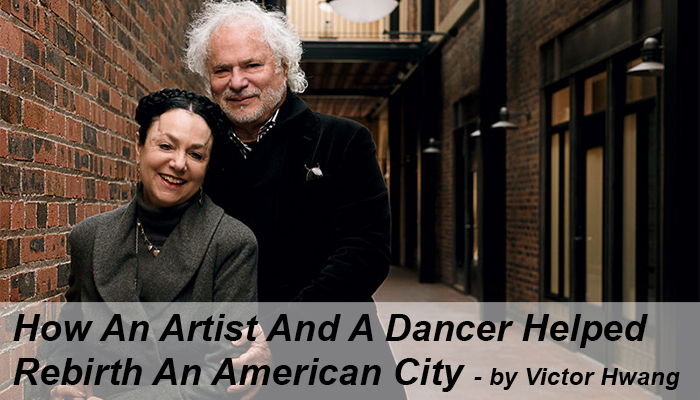 In this case, among those people was a surprising husband-and-wife duo – Frederick and Laurie Samitaur-Smith – whom many people credit as a significant force behind the city’s transformation. At first blush, they are unlikely heroes. Frederick was a former artistic assistant to Pablo Picasso. Laurie was the leading dancer at the opening production of one of Los Angeles’s great performance halls. But with their eclectic backgrounds, they were able to bring artistic sensibilities to urban development – particularly a focus on human emotion, interrelationships between people, and the core motivations that drive human action. Are their lessons applicable to other cities? I believe the answer is yes. I’ve had the privilege of getting to know Frederick, after we realized that we are doing similar work. He was a featured speaker at our Global Innovation Summit last year. Frederick and Laurie succeeded in Culver City because they didn’t think of their work as merely building a city. Instead, they built an ecosystem. Ecosystems are based on the interconnectivity of things, not just the presence of assets. It’s not enough to have skilled people, good infrastructure, plentiful capital, and clever ideas. The key is how everything interacts together. Building ecosystems instead of concrete jungles is like making software instead of hardware. Think of it as designing the UX (user experience) of our economic lives. Victor Hwang: Many people credit you with reviving the urban vitality of Culver City. What was the approach you utilized to address such a difficult challenge? Frederick Samitaur-Smith: We focused on 4 primary areas simultaneously. First, we organized the surrounding community. This included assistance in securing financing for our neighbors’ home improvements. We asked them not to use credit cards or to buy automobiles. We gave seminars on “living within your means.” We encouraged them to save money while believing in the future they would get work that we would provide. That was our social contract. Second, we worked to create jobs. With the objective of creating 600 jobs within an area of 1500 homes, we started with small work-related education programs, like explaining how computers worked, etc. We acted as mentors, not teachers. And when anyone questioned us, themselves, or the government, we addressed the community concerns through the history of their own past, and we sought in the past answers to the present. However, we noted the present concerns of the community could be addressed through the simple pragmatic solutions we were offering, because our objectives were tied clearly to the past social values and business models that created their communities in the past. Third, we brought art. We actually discussed in open forums the meaning of physical and inner beauty, how literary history is filled with examples about how social differences based upon wealth and status were less important than developing ones’ minds. We emphasized the need for good education. Fourth, we utilized architecture. We took “no place” and made it “some place” by changing the facades on the existing building product. We incorporated a sense of contemporary art in our structures that was related indirectly to the birth of the Silicon Valley. Specifically we studied Cubism, and the Avant Guard geometries expressed in that movement. We talked about non-linear math. And we showed a relationship between the two and real estate. Then we demanded that every one of our buildings, once finished, would aim towards achieving a critical mass that would cause people to be overwhelmed by a sense of place, a sense of hope or awe, perhaps even human understanding. We had sought to build what the community wanted without a professional charade. Hwang: Why do most efforts at urban revival around the nation and the world usually fail? How does that contrast with your work in Culver City and other places? Samitaur-Smith: Our development was a private urban plan that did not seek to be funded by the government. We actually tried to avoid government financing. Because our economics and aesthetics were tied to a private program, our social ambitions were immediately comprehensible to private investors and banks, to the grassroots members of our community, and even to certain members within the elected city establishment. We could not run away from a building’s economics, its revival, what it looked like on every level after it was re-inhabited. Since we were internally financed, we had enough pressure on us to perform, because we were personally responsible for our projects. Therefore, we had to be “independent,” and no one could corrupt our vision. Once we got investors, we made sure our banks and others were paid back at market interest rates in full before we took any money out of our deals for ourselves. Other urban revivals are driven by government incentives, grants, bonds, and tax assessments. But in the beginning, we did not know these programs existed, and we inherently could not fail because we were legally personally liable to pay back the money we borrowed. We were able to convert the community liabilities, such as subsurface contaminants, into marketable assets. At the same time, we stabilized the crime so much that, when comparing incidents of minor crimes against Beverly Hills, we bragged our area was safer than Beverly Hills in certain related areas, like purse snatching. We took the communities’ ambitions and turned them into our vision of serious economic objectives. We explained that the community itself had to solve its own problems through a hard work ethic. Our vision was grounded in their vision, with achievable objectives, and an increase in personal wealth. We bought abandoned buildings at discounted prices, granted their intrinsic utilities, and we proposed homesteading young, ambitious companies in the architecturally interesting spaces. Then the ambitions of the young entrepreneurs, monetary and social, were wedded to the community through company-sponsored job fairs because the entrepreneurs wanted workers. The community wanted a means by which they could get jobs, which generally led to the community supporting the young entrepreneurs. And eventually, once the community saw how hard the entrepreneurs were working, people demanded for their children better educational and health services. We even helped reclaim the city parks by encouraging the removal of gang activities and supporting an area dedicated to skateboarders. We “lived” in the area so we had to be accountable to our neighbors, our investors, our banks, and ourselves. Once they saw us recycle their abandoned resources and convert them to assets that could be appraised by banks, they bought in, and they invested in their own “properties.” For instance, the area became self-policed. We developed a reputation that allowed them to believe in themselves and us, because we were not federally mandated to invest in lower-income areas. We did it by choice. Hwang: You are sometimes called an architect or an urban planner, but you have said those labels don’t really capture your work. How does your work differ from traditional architecture or urban planning? Samitaur-Smith: I am not a service provider, I am not a government official, and I am not a social engineer. I am not an urban planner, I am not a professional, and I am definitely not an architect. But I know how to utilize all of those services to achieve economic and social stability. Hwang: Your and your wife’s backgrounds are eclectic and varied. What aspects about your backgrounds have proven to be the most valuable in your work? Samitaur-Smith: My wife and I were fortunate enough to learn early, as an actress and as a writer, that Shakespeare understood human nature and Milton the human heart, within the confines of psychology and spirituality. We both knew the limitation of art to provoke a real change in the world. We both knew that art is subject to arguments which basically state that all artists are ineffectual, actually elitists. Oddly enough, there were many artists who started out in one place, like Tolstoy, and ended up in another place, like communism. I do not think Oscar Wilde wanted to be the champion of the “me” generation because he was too intelligent. But he ended up its champion, the master of materiality and vanity. Both men failed to prove love triumphs over Death, but they tried. Oddly enough, my wife and I decided we should try to meet the cosmic challenge of who we were through brick and mortar. Thus, we bonded physical material to a social effort, which was to build a better world. Hwang: What is the future of urban development in general? How will it be different than what has come before? Samitaur-Smith: Sooner or later, urban development in general is going to be tied to individual social ambitions or freedoms, rather than tied to government dictates. Our cities need to re-invent themselves. They need to develop a new spirit to duplicate what is being lost in New York, London, Paris, Berlin, Moscow, and Beijing. Our cities need to preserve, not destroy, our individuality. And you cannot do that with someone looking over your shoulder. You have to do it on your own, in the way you define your life’s and communities’ purpose. It’s hard work. The projects featured in this article were developed, built, financed and marketed by Samitaur Constructs. Victor W. Hwang is a venture capitalist and entrepreneur in Silicon Valley. He is Executive Director of Global Innovation Summit + Week (February 17-21, 2014), an event focused on catalyzing systemic innovation across companies, communities, and countries.